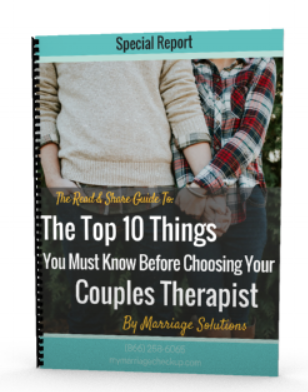 Everyone who goes into marriage has expectations of what that marriage will be like based on their upbringing, personal & family history, and what THEY WERE TOLD it would be like by their future spouse. A lot of my pre-marital couples who have never been married may not realize they have expectations for marriage, but they do. How can they fully realize them? They’ve never been married! So how do you adjust when you discover things aren’t as you hoped? You keep the dream! Yes, keep the dream of those high expectations and work very, very hard. Because high expectations are actually very beneficial for your marriage. You have dinner together every night...okay most nights. You help out when the baby arrives, and do more than is expected of you. You leave the TV off and focus on each other. You expect your partner to put you first before their family and you put your partner first before your family, your hobbies, and your work. You create opportunities for romance and respond positively to each other’s positive bids for affection. When things don’t go as expected you forgive yourself and your spouse for the shortcomings. You get back up, you adjust, and you try again. Fighting for your marriage is worth it! Marriage counseling can improve your marriage.